Description: She is the embodiment of a luminous summer's day, her brightly colored clothing swirling as she strides energetically through a sunlit garden. 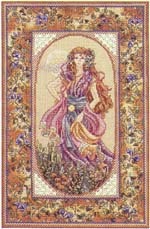 She is surrounded by a border of golds and vining floral greenery, accented with beads and specialty stitches. Night is the companion piece. Stitching Comments: This design is smaller than many of mine, but is just as challenging as the larger ones: lots of both quarter stitches and blended floss colors. The simple specialty stitches offer a bit of stitching variety.